If your attempts at cake decoration make your cakes look like haphazard lab experiments gone wrong, thenDecorating Cakes is going to get you all giddy. We all know that the ladies over at Australian Women’s Weekly are experts in the art of dessert-making, baking and decorating – after all, they did write the ultimate kid’s cake book in Australia’s history, Children’s Birthday Cake Book. And now they plan to share their insight with you, whether you be a beginner with a piping bag, or an expert in whipping up fondant to resemble a top hat. You’ll be astounded at what you can do when somebody stands by you and shows you how to do it (more or less)! 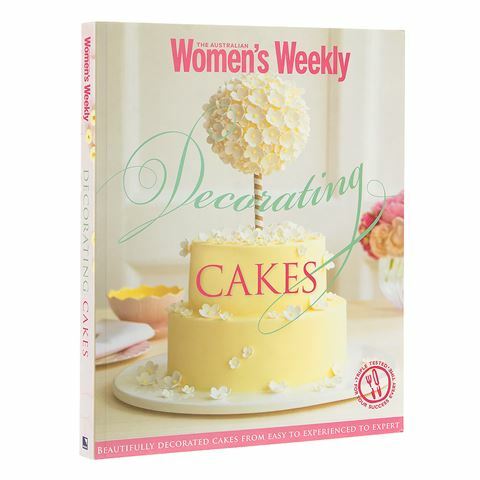 Every jaw-dropping cake within Decorating Cakes features step-by-step instructions on making such edible art forms as icing flowers, lace-embossed cupcakes, croquembouche, a pearl-studded wedding cake, and tonnes more.Decorating Cakes also covers the delicious basics, including how to make ganache and royal icing, how to stack cake tiers (without them falling!) and tonnes of piping and ready-made icing techniques to bring your cakes to life. "The Mechanics" chapter will show you what you need and how to use it to make stunning desserts for very special occasions. The only problem is, the results will be so good, you might not want to eat them! A full index, glossary and conversion chart. Step-by-step instructions on how to create masterful decorations with a range of icings, pre-made goodies, and piping techniques – "The Mechanics" of cake decoration. Recipes for basic cake batters used in the book's recipes. Covers cake decoration for occasions such as birthdays, weddings, baby showers and kitchen teas. Full colour photography and guides throughout. Recipes are triple-tested for your success.